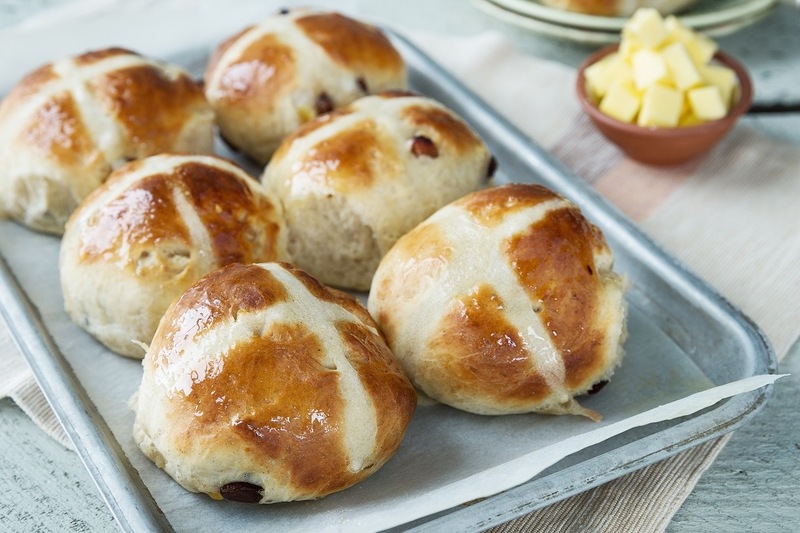 These traditional spiced, sticky glazed fruit buns with pastry crosses are often served as a classic Easter treat, and can also be enjoyed at any time of year. 1. Sieve flour, salt and mixed spice into a large mixing bowl, then rub in butter using fingertips until mixture resembles breadcrumbs. 2. Make a well in the centre then add sugar, lemon and yeast. 3. Mix in egg and milk to a form a soft pliable dough. 4. Then turn out onto lightly floured surface and carefully work the fruit into the dough until well combined. 5. Knead lightly for 5 minutes or until smooth and elastic. 6. Grease a large, warm mixing bowl with butter. Shape the dough into a ball and place into the bowl, cover with a clean tea towel and set aside to prove in a warm place for at least 1 hour. 7. Once proved, turn dough onto a lightly floured surface and knock back to remove air. Shape into a ball again and return to the bowl, set aside for a further 30 minutes to rise. 8. After 30 minutes, divide dough into 12 equal pieces. 9. Roll each into a ball, then flatten slightly into a bun shape and place onto a greased baking tray. 10. Cover again with tea towel and set aside to rest for 5-10 minutes. 12. Preheat oven to 240°C/475°F/Gas 8. 13. For the topping, mix the plain flour to a smooth paste with 2 tablespoons of cold water. 14. When the buns have risen, spoon the flour mixture into a piping bag and pipe a cross on each bun. 15. Transfer buns to the oven and bake for 8-12 minutes until pale golden brown. As soon as you remove the buns from the oven, brush them with the heated golden syrup, then set aside to cool on a wire rack. This entry was posted in Easter, Featured Recipes. Bookmark the permalink.